The term "Any Given Sunday" comes from the film by Oliver Stone of the same name, but it really comes from Steve Sabol and NFL Films, and the music and sentiment those films provided. "On any given Sunday..." I can still imagine Mr. Sabol bellowing, with the military-esque soundtrack backing him him... "even a 1-8 team can beat the best team in the land." This Saturday, we almost saw one of those types of moments at Fitton Field in Worcester, Mass. Not looking anything like a one-win team, Holy Cross gave Lehigh every single last thing they could handle, rattling off 21 unanswered points in the 3rd quarter against the No. 1 defense in the Patriot League and putting themselves in position to fire off the game-winning 43 yard kick with 11 seconds to play. The field goal would barely have the distance, but would be just wide right - the margin between winning and losing the game. Lehigh's 36-35 win would be the second time in three Patriot League games that their opposition would be in position to tie or win the game in the final seconds, but miss the conversion. "I credit our guys with our perseverance, their sticking with it, coming up with big plays we needed to at the end of the game," head coach Andy Coen said after the Great Escape. "We've been able to do that throughout the course of the season. Kids just hanging in there, and found a drive to keep it going. No apologies for being 9-0." Early on, it looked like it was going to be Lehigh's day to be 9-0 after Holy Cross' furst punt of the game was returned by senior PR Marcus Dormevil, a return tiptoed down the left sideline with a nice head of steam that was returned to the Crusader 3 yard line. 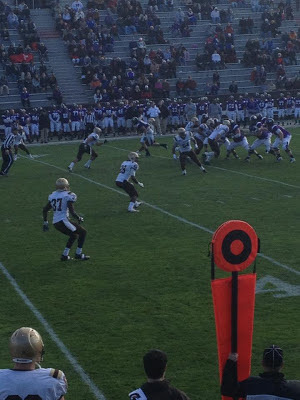 One option play converted by senior QB Michael Colvin later, Lehigh struck first. But any hopes that Holy Cross would roll over and get blown out were quickly dashed. After the Crusader special teams partially blocked Lehigh's extra point, sophomore QB Steven Elder went to work on Lehigh's No. 1-rated defense in their no-huddle, connecting early and often to 6'7 senior TE Alex Schneider to drive into Lehigh territory. Despite aggressive coverage by senior CB Bryan Andrews, Elder would find senior WR Gerald Mistretta fighting for the ball - and winning - as the Crusaders tied the game. One extra-point later, Holy Cross took an early 7-6 lead. Early in the second quarter, after both defenses stifled both offenses, Elder would guide the Crusaders on a 14-play, 90 yard drive, with a steady diet of running from junior RB Reggie Woods, who would have a career day for the guys in purple with 141 yards on the ground. After a nifty 30 yard run by Woods, Elder would fire the ball in for junior WR Mike Fess, who would give Holy Cross a 14-6 edge at the beginning of the second quarter. As they have done remarkably all year, however, Lehigh's offense, and especially Colvin, responded when faced with a deficit. After hitting sophomore WR Josh Parris with a big first down, Colvin would find junior WR Sergio Fernandez-Soto for another big 3rd down conversion on the very next drive, setting up a beautifully-diagrammed quarterback draw and perfectly-executed blocking up front. Again, as they have done all season, Lehigh's defense built on the momentum from the offense, with senior DE Tom Bianchi and senior LB Billy Boyko getting pressure on Elder on the very next drive and forcing a couple of big incompletions, forcing a punt. From there, senior WR Ryan Spadola, who made his reappearance on the team after a bout with mononucleosis, got Lehigh's next drive kick-started with a big 19 yard grab over the middle. Mixing up the targets well, Colvin would guide the Mountain Hawks all the way to the 2 yard line of Holy Cross, when Holy Cross junior DE Gary Acquah would singlehandedly bring down senior RB Zach Barket on 3rd down, forcing Lehigh to make a short 22 yard FG by senior PK Jake Peery to take a 16-14 lead into the locker room at halftime. In this battle of head coaches, neither was happy at halftime. "We've got to be able to tackle better. We need to run better," he told Lehigh Athletics' Steve Lomangino on the way into the halftime locker room. Just like the first half, Lehigh's second half couldn't have started in much better fashion. When facing 3rd-and-8 after receiving the second half kickoff, Colvin used his arm strength to throw the ball 60 yards downfield to a streaking Spadola. With perfect placement into Spadola's sure hands, he accellerated past the Holy Cross defender and almost waltzed into the end zone, a 73 yard strike. But again, on senior day, there was no way the Crusaders would make this easy. "In a season of struggles, Holy Cross — and especially its seniors — wanted to make a statement yesterday against nationally-ranked Lehigh in the final game this year at Fitton Field," Jennifer Toland of the Worcester Telegram-Gazette said in her recap. "Instead, the Crusaders almost made an exclamation." The Crusaders' exclamation would be 21 unanswered third-quarter points, starting with a response drive after Spadola's strike. In the second half, possibly due to an injury to Elder, sophomore QB Ryan Laughlin came in for Elder, and promptly guided the Crusaders on a scoring drive. A perfectly-placed ball, over the outstretched hands of senior FS Billy O'Brien, fell into Fess' outstretched hands on his second touchdown of the afternoon. The extra point would cut the deficit to two. A fumble on the kickoff return by Lehigh would swing the momentum squarely in Purple's direction. Four plays after Lehigh's only turnover on the afternoon and a 3 yard Reggie Woods bull through the heart of Lehigh's defense later, Holy Cross would have the lead, 28-23 - and the Mountain Hawks were in trouble. After a 50 yard completion to junior RB Keith Sherman got Lehigh into field-goal range, Peery's 38 yard attempt sailed just wide right - and Holy Cross, now moving at will against the Lehigh defense, would strike again. Holy Cross radio announcer Bob Fouracre was wowed by Laughlin's TD strike, a rifle through the middle, threading the needle to Mistretta in the end zone to cap off a 9 play, 75 yard drive against a gassed Lehigh defense. Mistretta would end the afternoon with 104 yards receiving and the two TD catches. The scoreboard read Holy Cross 35, Lehigh 23, with four minutes left in the third quarter. You are continually surprised when the Mountain Hawks pull the same rabbit out of the hat every week - even though you've seen the same trick, over and over, all season. While many, many Lehigh fans were having serious doubts about keeping all those win streaks alive - especially after seeing the Crusaders move the ball so effectively - the Lehigh players did not. Colvin's impressive leadership was again evident on Lehigh's "response drive" to the Crusaders' last touchdown, where yet again the magician pulled a touchdown out of his hat. Two big strikes to Spadola got the response drive started, as did two tough runs by "the magician" - as well as a huge hit by Holy Cross LB George Sessoms. On 3rd and goal from the Crusader 1 in an obvious running situation, Colvin would - abracadabra! - find sophomore TE Tyler Coyle on the play-action pass and make the score Holy Cross 35, Lehigh 30, with almost the entire 4th quarter to play. From there started a tense trade of possessions. Holy Cross seemed certain to score on their "reponse drive to our response drive", getting all the way to the 18 yard line of Lehigh and certainly in field goal range for junior PK John Macomber. But senior DE Anthony Verderame stripped the ball from Laughlin on 3rd down, where an alert Tom Bianchi fell on the ball - a huge play to stop Holy Cross' momentum. After a close 3-and-out stopped by a tough spot after a Colvin run, Holy Cross would move the ball again - but after Boyko stuffed senior RB Eddie Houghton short of the sticks, rather than go for it, Gilmore decided to try to punt, pinning Lehigh's offense. After another stopped drive, Lehigh's defense needed to step up again, and on 3rd and 5, junior DB Tyler Ward broke up a huge pass to force yet another Holy Cross punt. Give the Magician three tries, he'll pull a rabbit out of the hat every time, and on the third try, he succeeded. Four beautiful passes to Fernandez-Soto brought Lehigh to the Holy Cross 33 yard line, where Colvin went for it all for Spadola in the end zone - and found him. "It was a weak corner blitz," he told me after the game. "I was supposed to have a post corner but since the corner blitz I had no one to run a route on, so I took it vertical and Mike threw the ball in the perfect spot, allowing me to make the catch." Though the two point conversion was no good, the score read Lehigh 36, Holy Cross 35, with just under two minutes to play. With the Lehigh faithful on their feet, thinking "bend, don't break! ", Boyko and the defense did everything they could to stop the Holy Cross offense, who managed to get to the Lehigh 27 with 13 seconds left. Macomber had a chance to win the game with a 43 yard field goal from the spot. It barely had the distance, but just went wide right - preserving Lehigh's undefeated record at 9-0. It was, indeed, a Great Escape. On the Lehigh sidelines, it was relief. "I was real frustrated with myself, but I knew our defense was going to step up big," Spadola said after the game. To come back and win like this, I'm pretty speechless right now. "Words can't describe how glad I am to be back."